A friend referenced me on facebook recently, saying that I had ‘found my bliss’. I don’t know that that is true. We often have deep conversations around the table over lunch, or dinner and Davies and Scarlett are fond of asking questions such as ‘what are the top three moments of your life so far?’. I think I’ve said before on here that we are very happy but then we were already very happy and I think if we lived anywhere or did anything we’d still find our way to be very happy. We’ve had a lovely few days even though the weather has been grim. In between showers Ady and I have collected materials to build a wood store and bought wood of the local woodsman here on the island. We have spent spare half hours bringing the wood up the croft hill and I have been chief wood splitter. I like chopping firewood, it makes me happy. I think of that story of the grasshopper and the ant, I think of one of our WWOOF hosts who was an expert woodchopper and adamant that ‘girls can chop wood into matchsticks’, I think if the hours spent in the wind and rain last year gathering firewood in the depths of December and January. I remember splitting firewood back at our house in Sussex where we had an open fire and how we once had a particular chicken who would come and get all aggressive with me whenever he heard me chopping wood. There is something primal about wood chopping that touches me in ways other than making my back ache and my heart soar at the prospect of a full stash of firewood for the coming months ahead. And it’s not entirely to do with my yearning for Sarah Connor arm muscles either…. We’ve been collecting brambles – I gathered the first lot on Thursday while we were waiting for the Sheerwater and then Ady and I spent an hour or so this afternoon collecting more while the kids were at their art club with one of the Rum folk. They got to talk about arty stuff, do some mod-rock and get messy while we filled margarine tubs with brambles and chatted. This evening I turned them all into the first jars of bramble jam of the season – the first batch I have made with ginger, the next ones will be with chillis. I don’t like my jam to be boring! I have bruised and battered legs from rogue lumps of wood that objected to being split and bashed my shins, along with war wounds from carrying things up the hill, foragers fingers stained purple and a bit tingly from bramble pricks and nettle stings and my back and arms ache from three days of proper work but it would appear my bliss is sitting right here alongside me. The ‘this week on Croft 3’ white board is pretty full this week. Meetings x 2, dinner guests x 2, paid work, research projects and some practical stuff too. I honestly feel that it is the end of the tourist season just now in a way I didn’t grasp at all last year. Market Day has finished, the pressure feels off to have a steady supply of crafts ready to sell and instead thoughts are turning to the gathering season instead. The brambles are here – I picked my first tub full of them today and I have a large collection of jam jars all washed and ready to fill. There is still plenty to happen before this year is out, not least another two sets of visitors are coming – friends and family. All have been before so the stress of first time visitors to Rum and to our lifestyle is not there thankfully. We are also in a time of looking back over our first full year on Rum and what worked, what didn’t work and what we;d like to do differently or improve on for next year in terms of our livestock and crops. We have our first year of selling produce and crafts to reflect on and consider what we want to build on for next year too. We are hurtling towards our second winter and despite all best intentions, plans and hopes we will be facing it in our static again. This has both upsides and downsides. As we tend to focus only on the good we’ll take our usual silver lining viewpoint and know that we have dramatically enhanced our lives since this time last year. We have running water, a compost loo, a log burner which means the daily trip to the river to collect water, to the woods to gather firewood and the weekly hole digging for the contents of the loo are all no longer needing to be factored into our daily lives this coming winter. We know what to expect this year, we are able to get as ready as we can be and hunker down to weather it. Our vision for this winter is one of cosy firelight and candles. We’ll sit in our static and read books, tell stories, paint pictures, make things, craft, watch films, talk, plan, laugh, catch up on each other, play card games, sleep lots, venture out to feed animals, see friends in the village, gather supplies, feed the animals, bake bread, eat cake, recapture the summer when we eat jam, celebrate Christmas, Scarlett’s birthday, my birthday, the new year, Burns Night. Friends will visit and the internet will connect us to the rest of the world when we decide to dip back in to it. 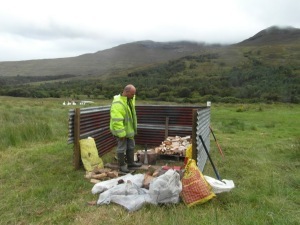 Yesterday we collected some tin sheets to build a wood store and the first lot of wood to put in it. We carried it up the croft hill and stashed it ready. This morning we assembled the pieces and marked it out. We listened to Popmaster and packed a picnic then went on the Sheerwater – I think there are about 3 trips left this year. Back at home we finished building the woodstore and I chopped up about half of our collected wood and stacked it on pallets. We need to finish chopping and stacking and then gather more. And then some more. Then we need to pick more brambles and make more jam. This year we’ll be on top of that hill. Along with being on top of our hill! 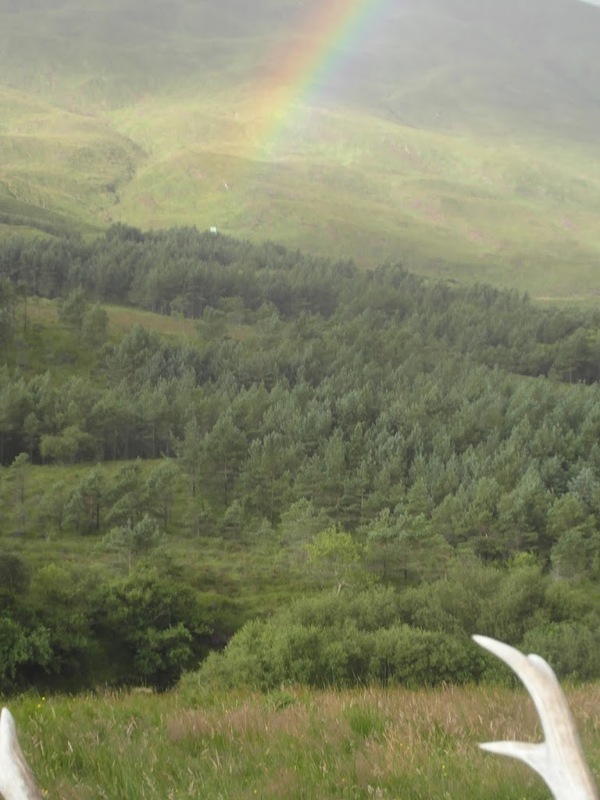 At one of our WWOOF hosts I first heard the expression ‘land’ used to describe the settling in period when you arrive somewhere. “I’m just going to land” – sit down, take stock of your surroundings, settle in, make sense of and then move onward. If I’m honest it sounded a bit too hippy and out there for me to ever identify with it, let alone feel the need to use the term myself. I think in my old life I was far more adept at launching from one environment to the next without any need to have a transition period – work to home to supermarket to kids activities, one city to the next town to the nearest village and back. Car to house to train to library. I might have shrugged a slightly different set of behaviours on and off depending on whether I was being Mummy, employee, customer, daughter, friend or volunteer but mostly I was being me in one of any number of roles I was very comfortable and at home in. Here in this life I do much of the same – I have many different hats to wear and roles to play but this time the uniform (jeans, sometimes muddier than others but always jeans) is the same regardless. I am quite capable of feeding animals, coaxing children out of bed and into breakfast and teeth cleaning, answering their questions and chatting with them, then heading to a meeting about road repairs, or venison processing or enhancing visitor experiences or talking to the architect about designs for our community bunkhouse, or manning the craft table at Market Day, or chatting to tourists at the croft gate about our turkeys and which of our duck, chicken or goose eggs would be the best choice for the quiche recipe. I can answer emails, edit the community newsletter, write articles for various places, talk about grant funding for events for the 2014 summer season and discuss employee handbooks and health and safety policies before doing some weeding in the polytunnel, repairing the netting on my raised beds, having a quick scratch behind the ears of the piglets and counting the chicks again to be sure they are all safe from the hoodies, baking bread, making jam, sitting chatting to friends while crocheting a hat. This is my normal, usual week. This last week has been a different sort of week though – it’s had all of the above alongside a trip to the mainland, car hire with last minute changes of plan, supermarket shopping, squeezing into changing rooms with Scarlett to try on endless pairs of trousers (her uniform is much like mine, except the knees have gone in all her pairs of jeans! ), playing host to two sets of people – one family of dear friends who we have known for nearly 10 years, another family who we’d never met before but were really lovely to meet and get to know, the stress of ferry trips, transport and travel and schedules and appointments and dentists trips. Returning home, unpacking everything and trying to get back into the swing of our everyday lives while still reeling from the mainland trip, keeping Bonnie settled, guests hosted and everyone fed and looked after. This morning we waved off our friends and then sat in the community Sunday teashop with a cup of tea and a cookie each. Ady and I went to our freezer and organised the food we’d shoved in there when we got back to Rum without putting away properly. 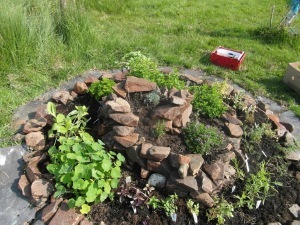 I went and sat for a while with some Rum friends in the sunshine before walking back, all alone, to the croft where I checked on things in the polytunnel, scratched a pig or four behind their ears, moved some mint from the herb spiral to my newly created mint circle, picked some herbs to dry, put away some laundry now we can actually get to the cupboards in the bedrooms in order to put it away and sat down with Ady, Davies and Scarlett to watch a film, eat dinner. Ten days and the next set of friends arrive, followed by family, followed by a trip off island for me. Somewhere in between we need to sort out another trip off to the dentist, organise another hire car, more accommodation and start thinking about getting ready for the winter. But for a short while, just a day or so, I’m planning to do a spot of landing. We’ve had a few days of high winds and heavy rain. The river is too high to cross and the walls of the static have been flexing and creaking. One night I was woken at about 3am by a banging and rattling and the hatch the covers the generator had come loose and spend the whole rest of the night making noises. The croft is a sea of mud once more and the nights are drawing in, there is a chill in the air and although it is only August we are thinking ahead to the winter to come. We are bird-tastic at the moment. The eight geese are doing really well. I can just about still tell which are the original two geese by their extra fat reserves but it’s not possible to see which two might be ganders yet. In some ways it doesn’t really matter as geese give us eggs anyway, it’s just that in order to breed and increase our flock, particularly if we want to eat goose then we’d be better off breeding from our own gaggle than buying in more birds. I’m sure the gender will out one way or another in the coming weeks. I’m hopeful we may still get some goose eggs this season too as there is a real market for them and at £1 each they are precious. 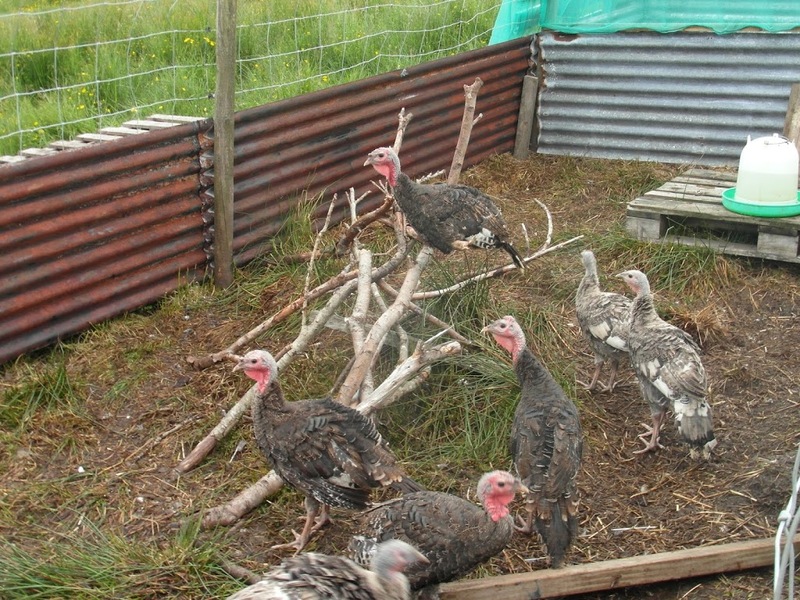 The turkeys have settled in really well and are sociable animals, following Ady and I about if we are working on the croft. They have a really big range of noises and are very vocal birds, from the traditional turkey gobble noise to a whole host of other sounds – whirs and cheeps and fax-machine type noises, they sound like the cute one in the gremlin movies. We definitely have three hens (females) and four stags (males) with one undecided. Often I am utterly convinced it’s another stag, then it looks all female and I change my mind again. We have a ready made market for the turkey eggs too when they start laying with someone offering to buy all of them off us. Again we will need to consider how best to maintain a flock, whether we retain a breeding stock, keep some hens for laying and fatten only the males etc. They are nice birds to have around and seem to have no problems running with all our other birds. The remaining duckling is doing okay, still with its mother and aside from the rest of the ducks but getting more confident in joining the group all the time. I don’t think she has taken it down to the river for a proper swim yet although it has certainly been in the ditches around the croft learning how. I think it is a drake (male) but it’s probably a wee bit early to tell just yet. We’re reliably getting three or four eggs from the other ducks which sell regularly. Again our plan long term is to keep at least one drake for breeding, keep all female ducks for eggs production and fatten any bred drakes for eating. We are almost over run with chickens – our own three broody hens have 12 chicks between them – they seem to be doing pretty well with that number and are out in the open with plenty of cover to run to but the crows are pretty sparse just now so I am confident they should do okay with these chicks. I can already spot at least 3 or 4 cockerels in that number. The pair of hens with over 20 chicks we have from a friend in the village are thriving and have merged into our own flock, joining all the other birds at feeding times. Eventually we will return the two hens to the village and just keep all the chicks when they are old enough to not need the hens for protection. That gives us an additional 30 odd chickens, bringing our flock to about 40. Of those chicks I have already identified a good 10 cockerels though and at most we’d only want another 2. Our plan is to identify the best natured and prettiest two and pen the rest for fattening. They will have a big run to enable as much natural behaviour as possible but get fed plenty rather than free ranging and scratching around for food as the rest of the birds do. 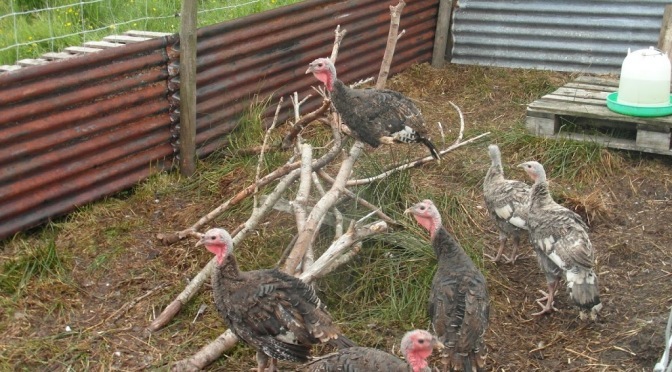 We won’t be doing any sort of speedy fattening but our plan is to rear some birds for meat and while we want our meat to be slow bred and fattened they do need to fatten and free ranging on 8 acres and beyond makes for very slow fattening indeed! One of our current (many!) research projects is a solar powered hatchery with incubator and brooder area lit and heated by solar power. This will probably entail an insulated and rodent proofed shed, incubators and pens powered by solar panels feeding into batteries and inverters. Now we have a healthy flock of birds with fertile males of all the types so we are getting fertile eggs the best way forward is to incubate eggs to increase our flock. All female birds will have a long and happy free range life supplying us with eggs, excess males will be penned in large pens on quality food to fatten slowly for eating. Ady is very keen to research peacocks. This is almost entirely folly on his part but as Ady is the one of us least given to folly I think he is entitled! There may well be a market for the feathers too. I like the idea of quails for the eggs and meat too but having had a bit of experience with hatching quails back in Sussex I know they really need to be penned in an aviary which I am less keen on the idea of so that might not happen. Things have moved on with our pigs and our buyer for two piglets has fallen through. This is a dual blessing as it happens. Firstly because we had been planning to buy in another gilt (female) to join Tom and Barbara as our breeding stock. Pigkeeping has been a real joy and pleasure for us so far. The breed we have (kune kune crossed with Gloucester Old Spot) is a tried and tested breed for the Highlands and Islands and thrives here in the climate and vegetation. They grow a thick furry coat in the colder weather to keep them warm and dry, have a lovely nature, are small enough to be easily manageable and have proved to be healthy, fertile and good parents aswell as being sociable creatures with each other, us and everyone else on the croft (human, avian and canine). We decided that to fully justify keeping Tom we needed a second female to be producing double the litters each year. A bit of research and some advice from pigkeepers means we have decided to keep one of the female piglets to breed from. It appears that breeding Tom with one of his daughters is low risk and fine for breeding for meat. This means we don’t need to buy in another gilt but the best news is that Scarlett had been really struggling with the idea of one of the wee girl pigs being sold or eaten as she has fallen in love with her. She always had an affinity with this one particular girl although she is very philosophical about the others going and knows that she has made an error in getting close to an animal destined for sausages. As ever we are learning all the time and on this occassion events have conspired to allow us to keep the girl, breed off her so we are not compromising our business plan for livestock. The piglets are about 16 weeks now so the two boys have 10-12 weeks or so left, the other girl can go a bit longer aslong as she is kept clear of Tom if she comes into season. We have a plan for the kill and process of them when the time comes, although it will only be for our own consumption legally. In other news we are off to the mainland tomorrow for two nights. Fitted around a visit to the dentist for the four of us we have some charity shop shopping, some supermarket food stashing and maybe a visit to a fast food joint to fit in. Bright lights, razzle dazzle, and the chance to spend two whole days not wearing wellies! Or whatever else it is they have at a carnival. I think I always link carnivals and carousels in my head but anyway. A good friend of mine Jax over at Live Otherwise is organisintg a blog carnival about Home Education. I’ve said before on here that this blog is not really about Home Education. Well no more than it is about off grid living, self sufficiency, island life, WWOOFing, family travel, livestock rearing or any of the other things we do which don’t define us but do make up the component parts of who we are. But I’ve not posted much on here of late about Home Ed so when Jax mentioned a not back to school type of celebration during back to school time I thought I’d join in. It felt a little timely having had a few conversations of late about what we do and why we do it. Why do you home educate? Before we even had children we said we would celebrate them as individuals. Allow them to follow their passions, interests and their dreams. We would not coerce or make decisions for them based on our ambitions or priorities, rather support them in what it was they wanted to spend their life doing and assist, facilitate and aid them in making that happen.We Home Educate because we don’t believe that school offers the best possible childhood and that childhood is in part a preparation for life and in another part simply a period of your life. That education is not something that gets delivered to you, rather an array of opportunities, ideas, sparks and springboards, a collection of inspirations to set you off in a certain direction on a journey. We believe that a broad and balanced curriculum, a structured and formal education is narrowing and restrictive and one size fits all rarely suits anyone. That institutions are never a good place for anyone to be. In the early years we home educated by following every single passion and interest the children showed. Aged 3 Davies was into dinosaurs, we got out every book the library had on dinosaurs, went to the Natural History museum in London, watched documentaries on dinosaurs, made models of them, trawled car boot sales for a bucket full of plastic ones, learnt about their habitat, their names, the periods they lived in. We visited Lyme Regis and went fossil hunting on beaches. We baked dinosaur shaped cookies, drew dinosaur pictures, compared everything we could think of to dinosaur sized, got a season ticket to a local museum attraction with a large interactive dinosaur exhibit and went fortnightly til we knew everything off by heart, spent hours categorising the toy dinosaurs into herbivores and carnivores. Within that we covered every subject on the curriculum – art, geography, history, science, maths, literature, field trips…. Davies is unlikely to be a palentologist when he grows up and actually while I can still identify most dinosaurs by name I don’t think he can anymore but we certainly never missed an opportunity. I spent a lot of time when the children were young networking with other home educators to ensure they had an active social life. They joined scouts, guides, st Johns Ambulance badgers, took swimming lessons, gymnastics, tumble tots, various sports groups, museum activities, school holiday events, RSPB wildlife explorers. We had membership at any given time to at least three places locally from wildlife reserves, zoo parks, museums, theme parks. We took advantage of theatre and cinema educational events, school rate visits to Legoland, National Trust properties and workshops. We visited London almost monthly, the library weekly. We were out and about in the community talking to our neighbours, people in shops, friends and family. In short we immerse Davies and Scarlett in life, talk to them constantly, always find the answers to their questions and listen to them. Our life here on Rum may lack some of those opportunities we used to enjoy in many ways. We cannot access the cinema and theatre, art galleries and group activities are out of our reach but we have hit a new phase where the childrens’ interests are more honed and specific now. Davies is still into his art, nature and storytelling. Scarlett is into her animals. It is now a case of finding opportunities here and making the most of contacts. Their week still includes the biggest part of their time spent with us, talking, learning together, listening to the radio, the news, but they also have their own responsibilities now. They are learning about business skills and how to make money, market things and develop a brand. They understand how the croft works financially and any decisions made are talked about between all four of us. They have close access to a wide range of people here they can spend time with and learn from with a huge scope of crafts. Davies is learning the guitar from one person, Scarlett has volunteered to do things with the ponies, the shearwaters and the bats monitoring. They do a regular art and film club with another resident and play board games with another. They spent time with the ranger regularly learning about bird ringing, wildlife here on Rum and have done a series of Junior Ranger workshops. Is there anything you’d do differently if you did it all again? Not at all, I consider us very fortunate to have never gone very far down a route that didn’t suit us. I am so pleased we never headed off along a formal structured route as I don’t think it would have worked for us at all and having never taken away the childrens’ autonomy to be in charge of their own learning we didn’t need to unpick any damage done. People. And our own ears. We will always learn far more from listening to others, to their lives, their experiences and their ideas than from any book, website or other resource. Actually getting on and doing things ourselves is the most powerful learning tool of all. What’s the daftest question you’ve ever been asked about home education. Hmmm. So many isn’t there. How will they learn anything? Don’t you have to be checked up on? What if they hate you for not letting them go to school? I do think that Home Education is getting more and more known and accepted although our particular brand continues to be fairly misunderstood and lack confidence in it’s efficiency and methods. The idea of not fretting about literacy and numeracy or any sort of measurement against what other people might be doing really pushes people’s buttons. No one ever denies that our kids are not doing really well – even in our tiny little corner of the world with just 40 people I get told how awesome my kids are at least once a week by someone. They might argue that they’d still be just as happy, healthy, curious, interesting, interested people if I’d spent hours and hours with them at a desk enforcing reading, writing and arithmatic on them from aged 4 onwards but my guess is they would not. They would not have such unshakable confidence in their own ability to find something that interests them and make it their business to learn all they can about it if I’d taken away from them the responsibility for directing their own learning. And anyone who has advice for the people who say I’d love to home educate but I don’t have the courage, I wouldn’t know where to start, we can’t afford it, I could never do maths, that would be particularly great. The best advice I ever heard in response to that is that Home Education is not for everyone but its not beyond anyone. If you want to do it, really want to do it and it works for all of the people involved in it (in our case that’s Davies, Scarlett, Ady and I, if any one of us was not happy with our situation then it would no longer work) then you can do it. It may mean life changes, it may mean heading off in a different direction altogether but it is doable. You start by answering the very first question your child asks and you head off, hand in hand learning the way together. You afford it by only ever spending what you have – libraries and museums are free, art materials and inspiration can be found just by walking around where you life, most people have a TV and internet access which offers you all the resources you could ever need for free. Some very good friends of ours have a blog which talks about not realising how far off the path they had come until they turned around and couldn’t even see the path any more. Turning around and looking behind you is not something you should spend too much time. Just in the same way that gazing forever into the future and trying to see what lies ahead is not a productive use of today. But every so often it’s an affirming thing to cast a glimpse behind you. As a child and teenager I kept endless diaries. They documented heartbreak, hopes, dreams, angst, anger. Through the pages you can still feel the emotions of my past self still there caught in the turquoise ink and outpourings of emotions. The doodles, the practising of a signature I might have if I were to one day marry a certain someone (and yes, my current name is there many years before it actually was my name…). Every so often as an adult I have pulled them from a hiding place and spent time recapturing those days. I have a massive affection for my past self, I totally understand where she was coming from and what she was feeling, possibly even more so now I have children of my own. But I also have the benefit of years of wisdom and the gift of perspective and hindsight. I know that the broken heart did heal, the A level results didn’t actually matter a jot, the agonising over whether to chose a certain path or not panned out just fine. It’s over three years now since we set off on the path that led us to Rum. Every so often we just pause and take a breath and realise how far we have come. Geographically it’s 600 miles and a ferry trip, lifestyle wise it’s a four bedroomed house, two cars, a pension scheme, a whole host of bills and not nearly enough soul feeding to self employment in a whole mish-mash of endeavors. a static caravan and whatever ameneties we can cobble together ourselves, philosophically it’s a leap from a wish to live a lower impact greener lifestyle to being pretty extreme. We’re very happy but to be honest we were always very happy. It’s kind of who we are and what we were and what we’ll always be. Tonight Ady has been researching hydro power – we’ve met all our energy needs (with the exception of our freezer which is down in the village and a washing machine as we use the laundry room at the castle but we hope to sort out both of those during the year ahead) with solar this summer, minimal investment and very efficient. But we are aware it will not suffice through the winter so are looking into ways of harnessing more of the earths energy to charge up our phones and cameras, give us light and keep our fridge cold. In the last week we have finished our fruit cage – a 10 metre by 10 metre cage with sides, roof and gate which will house all of our soft fruit to keep it safe from deer, crows and our own birds. It cost us less than £50 in materials as we bought in the posts, roof netting and cable ties but the gate was made from reclaimed pallets and the walls from gifted broken mesh panels. Three years ago such a project -from vision to completion would ,been beyond us, now it’s just what we do. We have become inventive, creative, able. We are able to look at what we have done and critically asses what we could have done better and would improve on next time. 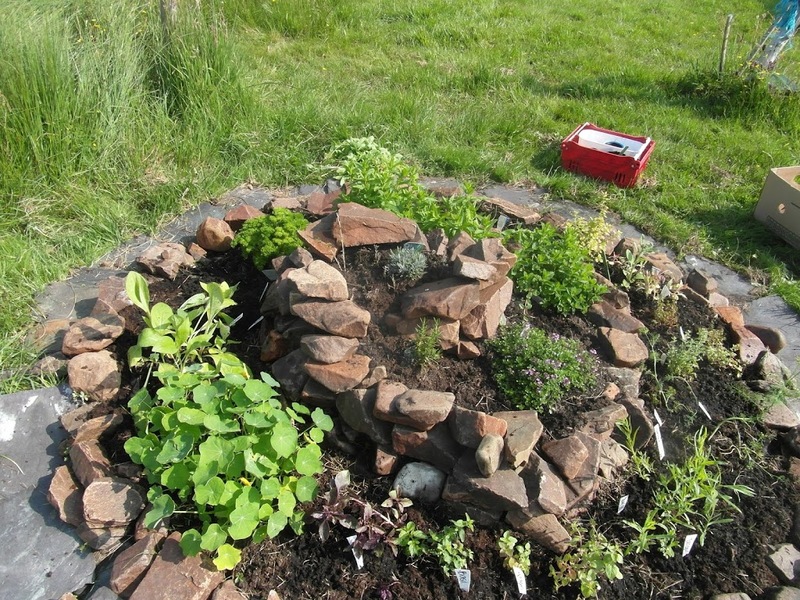 Never did I believe that at nearly 40 my greatest period of learning is still to come as I devour books and magazines on permaculture, growing fruits and veg, rearing livestock, using a polytunnel, soil conditioning and improvement. While Ady at nearly 50 is learning that far from just plugging devices in to a wall socket and paying a monthly electric bill there is free energy to be harnessed at very low set up cost if you just grasp how to make use of it. That path behind us? I’m thinking we could improve it, add some decorative features and turn it into the exciting symbol of a journey it deserves to be. In the last couple of weeks we have had emails from two people who we WWOOFed with back in 2011. They don’t know each other, it’s pure coincidence that they happen to have decided to get in contact with us around the same time as each other. Both were other WWOOFers, both single men that we crossed paths with at different WWOOF hosts. We didn’t actually have other WWOOFers with us at most of our hosts, mainly because if they were accommodating four of us it was pretty much their quote I think. With both of them we were with them for only about a week before heading off our seperate ways but there is something about WWOOFing and that shared experience that bonds and binds you in a special kind of way. Ady likened it to the feeling that co-survivors have after a disaster; you’ve been through a life changing experience together, been a part of something that most people will never know. Funnily enough these two co-WWOOFers joined us on our two most extreme WWOOFing venues. Both totally off grid, both a long way from civilisation. One was an intentional community – a group of families, couples and individuals living in an area of woodland carving a self sufficient life together. The other was one family living on a remote hillside in a series of rescued buildings, tents and old caravans, growing food, rearing livestock and dreaming big. These were the sorts of places and indeed people that we didn’t even know existed a year beforehand. Back then we thought we were pretty unconventional with our Home Educating and our not altogether mainstream ideas about stuff. But these people, living here in the UK, opting out of mainstream society altogether taught us a whole other lifestyle. You don’t need electricity piped in from an energy supplier, gas can come in big orange bottles rather than the mains, water can be diverted from a stream or river or collected from the rain rather than coming from a treatment plant and human waste should at worst be dealt with without gallons of drinking water, at best be considered a resource. That a car if you have one at all is a mode of transport to work for you only when your own two legs cannot rather than a status symbol. The pleasures of tasting food you have grown yourself, working alongside others and connecting with fellow humans, finding joy simply in living and being with nature is time better spent than ever sitting on the sofa channel flicking on the TV or plugged into endless games consoles. That if you love your life all the time there is no need to plan holidays and time off from your own life. One day, in the not too distant future it fills me with excitement to think we could be hosting WWOOFers and giving them the opportunity to experience these things, forge these connections and make these acquaintances. Year one for us here was about finding our feet, finding our place on Rum and getting our heads around how life was going to work. Year two so far has been about adjusting our plans and ideas to fit with the reality rather than the dream, about fine tuning and honing and slowly making things happen. We’re breeding our livestock, selling our produce, working out what sells and what works and what makes us happy. Year three when it comes will be about moving forward with the next phases – building and opening things up to more people. Meanwhile it’s drawing to the end of the tourist season here on Rum. Our last Market Day is this week, that will be the seventh. It’s been good, I’ve had some real successes with breads, dried herbs and preserves. My ‘moods of Rum’ scarves have sold really well in the craft shop and Davies’ postcards have been a huge winner. We’re selling eggs well from our honesty tables and through the shop aswell as supplying the guest house here on Rum. There is a big market for duck eggs and requests for goose and turkey eggs from the other islands and mainland which we’ll hopefully be able to meet next year. It feels strange to already be looking to the turning of the season in August but it’s how it works here, nights are drawing in and the weather is already changing. 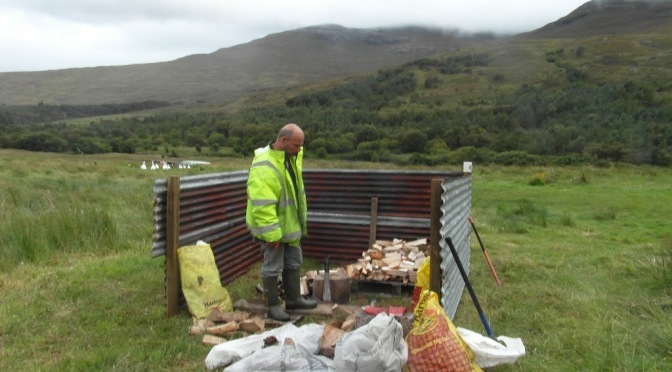 I’m already thinking ahead to the winter – crafting ready for next year, getting firewood ready, planning book clubs and film nights, plotting to have a really strong events program on Rum for 2014 and see what funding we can secure to help with it. Meanwhile venison processing is happening in earnest and we’re fattening those turkeys for selling and the piglets for our own consumption. Raspberries are doing well with me foraging enough for a couple of jars of jam a week so the store cupboard is already starting to fill up and the blackberries are only a week or so away from first pickings. We’ve still got a full diary ahead of us though with at least three more lots of family and friends booked to visit and a brief mainland trip coming up for us next week to visit the dentist, stock up on food shopping and have a brief taste of mainland life. the turkeys, growing and looking more prehistoric every day! We’ve actually had a fairly quiet tourist season this year compared to last year. I think given our arrival at the start of the early tourist season in 2012 with a brief flurry of attention on us we enjoyed a minor celebrity status last year. This year while we have talked to any visitors who have crossed our paths (and wanted to talk, we don’t accost people you understand!) it has felt less intrusive I think. However we do still spend a good couple of hours a week chatting to people visiting Rum and we really enjoy that. Just today a family stopped to buy eggs from our honesty table at the croft gate while Ady and I were down working on building a fruit cage so we invited them to have a look at our newly hatched chicks and had a chat with them about our lives here. On Wednesday I had a really nice chat with some tourists from overseas who had read about us and were interested in our year traveling and some of the places we;d been to in the UK as they were over visiting from elsewhere in Europe and keen to get a flavour of the UK in their brief time here. This last few weeks though we have been slightly more in the spotlight as we were all (and I mean all – dog, birds and pigs) caught on camera for a piece for BBC Alba who are filming a series on various islands and spent a few days here filming various aspects of Rum for one of the episodes. They were a lovely team of people; researcher, presenter, sound man and camera man and it was great to meet them and chat off camera. I look forward to seeing the results of their time on Rum and their view of our island. Then last week I was interviewed for TV, radio and newspaper as part of the Kinloch castle options appraisal regarding what happens next to the castle. I was giving an islanders perspective and I think the coverage that went out was really good and hopefully will help raise awareness of the plight – and possibilities – of the castle. The weather has been a real mix of glorious sunshine and midges, coupled with some very heavy rain and a wee taster of the winds to remind us just what the winter will be like again. No good being in denial, it is coming and is realistically just weeks away. Our broody trio of hens have hatched 15 chicks, well slightly more but there were a few failed hatchlings. 15 healthy so far. We have split them up as one chick was getting injured and one hen was being bullied but we had a pen ready so fingers crossed have sorted that. We also have two relocated hens with a clutch of chicks each from the village who are doing well. So about 35 chicks in all at the moment. I have already identified several cockerels in the flock so once they are all grown and settled we’ll peel off the boys and pen them for fattening. The turkeys and geese are all doing really well. The remaining duckling is growing well and is close to being able to free range again. The croft is definitely fertile as far as animals are concerned. The piglets are over half way through fattening and the two we have sold are due to leave us (only to go next door) sometime this week. Crops wise the herbs are doing splendidly, I sold out of my dried herbs at Market Day last week so have more dried and packed ready for sale this week. Herbs are definitely the way forward. Other crops are doing well but I have learnt that here on Rum you need to write off July and August in the polytunnel as it is midgetastic and therefore not feasible to spend time in. On the visiting TV presenter’s advice I have ordered a book specifically about growing fruit and veg in Scotland so will see what information I glean from that. Foraging wise I am still merely an enthusiastic amateur but have been jarring raspberry jam as frequently as I can spare an hour to go picking so am up on last years tally at least.